SAPPORO - Hokkaido Nippon Ham slugger Sho Nakata knew what he had to do when the Pacific League champion was trailing four runs behind the Fukuoka SoftBank Hawks after the first inning of a crucial postseason game Sunday to decide who will advance to the Japan Series — never give up. 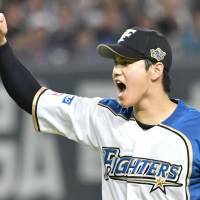 His thoughts resonated with his teammates, including right-hander Shohei Otani, who contributed to the team both on the mound and at the plate from the start to finish of the PL’s Climax Series Final Stage. “I thought I shouldn’t give up until the very end,” said Nakata, who was named the most valuable player of the series after hitting a solo home run in the second inning to ignite the Fighters’ comeback. Nakata, who was hitting .429 after the first two games but had no hits in the last two games, went 3-for-3 in Game 5 against the Hawks, opening the decisive three-run fourth with a hit and doubling to set up Kensuke Kondo’s two-run double in the fifth. Describing his own home run as “perfect,” the 27-year-old said he is glad he and his teammates were able to start fighting back immediately after falling behind for a 7-4 win. 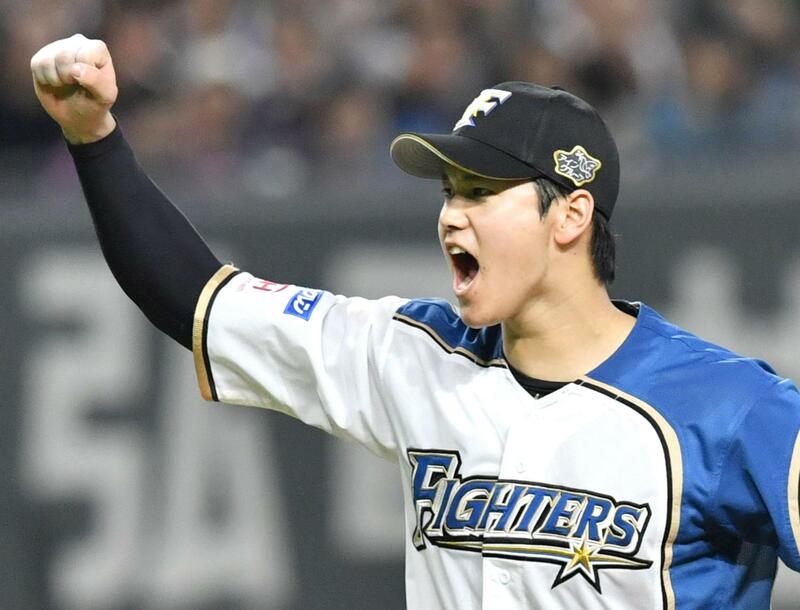 “We were able to produce this outcome owing to the cheers from all of our fans, so I want to thank everyone,” said Nakata, who had two home runs and five RBIs in five games of the final stage. Otani, 22, started the PL’s final stage opener Wednesday when he tossed seven solid shutout innings and played in the next four games as designated hitter. He then wrapped up the stage on the mound Sunday, throwing a perfect ninth while clocking a record 165 kph. Otani came one step closer to the record of 105 mph (about 169 kph) in the U.S. major leagues, set by Chicago Cubs closer Aroldis Chapman in July when he played for the New York Yankees. Otani and Chapman, a 28-year-old Cuban lefty, have similar build, both standing 193 cm tall and respectively weighing 92 kg and 98 kg. The fourth-year player also picked up his first save Sunday — something he has not yet done during the regular season.